Chile was one of the first wine regions I really got into. From a value perspective, it’s a hard act to beat. But, there’s another side to Chilean wine that, admittedly, I’ve not spent nearly enough time exploring. So, when presented with an opportunity to dig into the critically acclaimed, ultra premium wines of Chile’s Don Melchor with winemaker Enrique Tirado, I jumped at the bit. 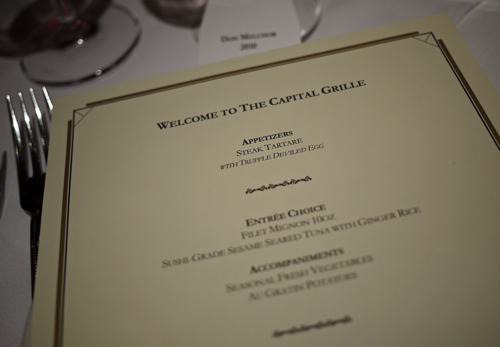 Of course, it didn’t hurt that the opportunity presented itself in the form of a luncheon at Downtown Boston’s iconic Capital Grille. Don Melchor is owned by Concha Y Toro. Which, at face value may have you thinking that the winery is playing in the low-mid end of the market. But that thinking would lead you astray, because Don Melchor is at the top of pyramid. It is Concha Y Toro’s pièce de résistance. A sharply focused, high end brand that is producing Cabernet Sauvignon-based Chilean wine that sells for upwards of $100 per bottle. This wine, in short, is the real deal. 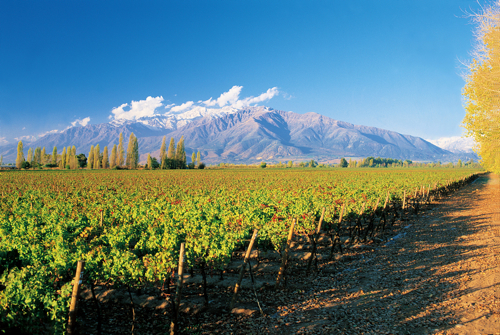 The Don Melchor vineyard is situated at the foot of the Andes, on the banks of the Maipo River, in Chile’s Alto Maipo Valley. The 114 hectares vineyard area has been broken into parcels, in which vines produce grapes that truly represent the micro terroir of each individual piece of land. 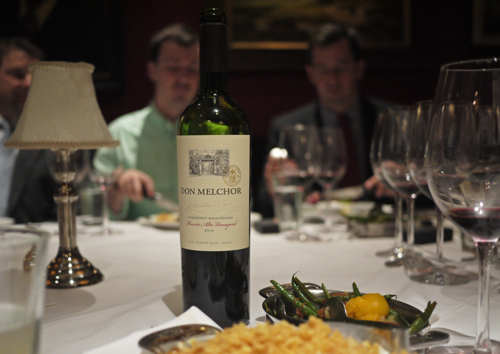 Tirado, along with legendary wine consultant Jacques Boissenot and his family (who have worked with wineries including the likes of Latour, Lafite Rothschild, Mouton Rothschild and Margaux) oversee these parcels, carefully selecting and blending grapes from each to create the winery’s core offering: Don Melchor Cabernet Sauvignon. The highlight of this particular wine lunch was getting to explore the individual wines from each parcel, taken from the latest vintage. The differences were astounding – some grapes presented softer, red fruit-driven wine, while others presented nuttiness, or minerality, dirty funk, salinity, cassis. Some had subtle tannins, while others had solid backbones and layers of complexity. An amazing array of diversity for a single vineyard property. 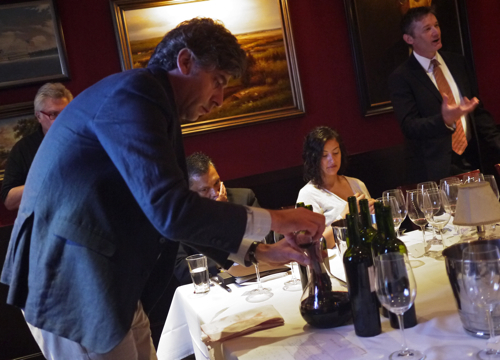 Enrique Tirado, after tasting us through each of the seven unique parcels, blended the wines together at the table. He offered up his blend and the result showed off a tremendous level of complexity – bringing in all of these unique aspects from the various parcels into one unified wine. Of course, the blend was just an example – not a finished product, nor meant to show the ultimate wine that goes out to consumers. That was saved for the finale. The 2010 Don Melchor Puente Alto Vineyard Cabernet Sauvignon is the current vintage – available at retailers now. And, from one wine lover to the next, let me assure you that it is phenomenal. Of course, this final product has oak aging, and various other elements of wine production to show, but it soared above the individual parcel blend. It jumped out, from an intensely aromatic nose to an impeccably balanced, layered palate. All of those unique flavors and aromas came together magnificently, held together with an elegant oak profile and tannic structure. The wine, in short, blew me away. And for all of you California Cab fanatics and Bordeaux lovers who don’t blink at spending $100+ on a wine to lay down, I highly recommend that you seek this bottle out. It belongs in that conversation of ultra premium Cali Cabs and Bordeaux’s any day of the week. It can hold its own. Don’t believe me? Wine Spectator just gave the 2010 vintage 95 points – just short of the 96 point score the wine was given for its 2003 and 2005 vintages, the highest rating Spectator has ever given to a Chilean wine. It has also placed in the top 5 of Wine Spectators Top 100 list twice in the last ten years. It’s funny what a wine like this can do to you. You can literally be sitting in one of the best steakhouses in Boston, eating a perfectly cooked filet mignon, with the cheesiest and most delicious potatoes au gratin you’ve ever had, and be thinking: wow, this wine is absolutely stunning. I love eating amazing food. But for me, I am a drinks enthusiast at heart, and when a drink truly soars, it soars beyond everything in its way. 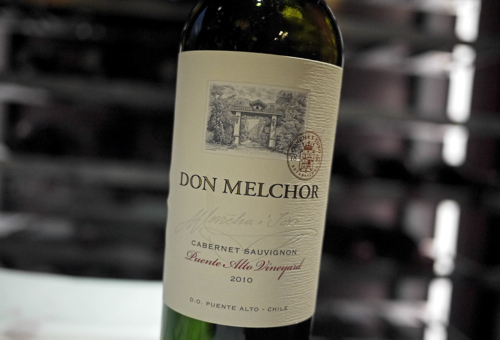 Don Melchor Cabernet Sauvignon soars, and brings Chilean wine with it to a truly remarkable level. Previous ArticlePack up the VW, Sierra Nevada’s Epic Beer Camp Across America is Almost Here!